Carfilzomib-based regimens are well tolerated and offer a neuropathy-sparing approach in newly diagnosed MM and WM. 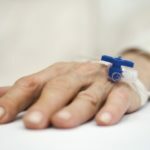 Consistent with prior studies of carfilzomib, and in contrast to bortezomib-based regimens, the study showed that treatment with carfilzomib was tied to low rates of peripheral neuropathy in patients. “Our data suggest that carfilzomib-based regimens are well tolerated and offer a neuropathy-sparing approach with excellent responses in newly diagnosed MM and WM making them a good choice for frontline treatment of these diseases,” researchers wrote. The study looked at efficacy and safety of frontline carfilzomib-based regimens in 54 patients with newly diagnosed myeloma and 6 patients with WM treated between 2014 and 2016 at The University of Texas MD Anderson Cancer Center, Houston. Patients with myeloma were treated with either KRd (carfilzomib, lenalidomide, and dexamethasone) or KCd (carfilzomib, cyclophosphamide, and dexamethasone). Patients with WM were treated with carfilzomib, with dexamethasone and rituximab. There was a 98% response rate for patients with myeloma with 77% of patients undergoing upfront autologous stem cell transplant. After transplant, responses deepened with 58% of patients achieving complete response, 29% achieving very good partial response, and 13% achieving partial response. At a median follow-up of 7.4 months, overall survival was 100%. Five patients had to discontinue therapy due to toxicity, including 1 patient with neuropathy. All patients with WM had clinical benefit and resolution of B symptoms and anemia after treatment. The major response rate was 67%. At a median follow-up of 33.5 months, overall survival was 100%. One patient with WM had severe toxicity: debilitating neuropathy, which was attributed to treatment with rituximab. Chaudry M, Steiner R, Claussen C, et al. Carfilzomib-based combination regimens are highly effective frontline therapies for multiple myeloma and Waldenström’s macroglobulinemia. Leuk Lymphoma. 2018;130(Suppl 1):1880.